The Louisiana State Museum, founded in 1906 and headquartered in New Orleans, encompasses a network of fourteen facilities located across the state. Its collections comprise the largest and broadest extant holdings of fine and decorative arts, historical artifacts, and research materials documenting Louisiana history and culture. During Hurricane Katrina, the LSM's Old U.S. Mint, a National Historic Landmark located in the French Quarter and constructed in 1835, was severely damaged. Its copper roof blew off; water ruined interior finishes and the HVAC system ceased to function. At the time of the hurricane, the 71,000-square-foot facility housed exhibitions on jazz, Louisiana decorative arts, and the history of the Mint itself. In addition, approximately 60% of the LSM's collections were stored in the building, including its entire, internationally renowned jazz collection. While a relatively small number of artifacts were water damaged, the threat of mold forced the emergency evacuation of artifacts to a temporary, 20,000-square-foot storage facility in Baton Rouge. The evacuation was carried out over a period of eight months and involved both LSM permanent staff as well as professionals specially recruited for the purpose. At the core of the LSM's Music Collection is its internationally known Jazz Collection, the largest and most comprehensive of its kind in the world. The Jazz Collection chronicles the music and careers of the men and women who created, enhanced and continue in the tradition of New Orleans jazz at the local, national and international levels. It consists of instruments, pictorial sheet music, photographs, records, tapes, manuscripts and other items ranging from Louis Armstrong's first coronet to a 1917 disc of the first jazz recording ever made. 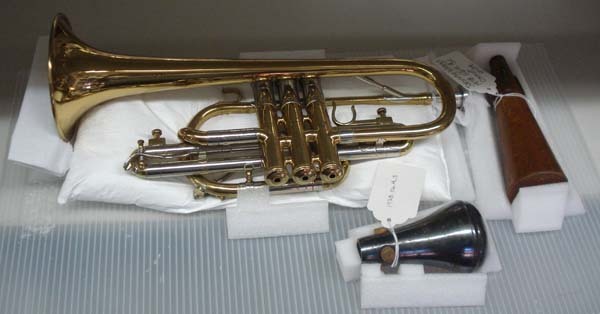 It includes the world's largest collection of instruments owned and played by important figures in jazz - trumpets, coronets, trombones, clarinets and saxophones played by jazz greats such as Bix Beiderbecke, Edward "Kid" Ory, George Lewis, Sidney Bechet, and Dizzy Gillespie. Other artifacts in the jazz collection include some 10,000 photographs from the early days of jazz; recordings in many formats, including over 4,000 78 rpm records that date from 1905 to the mid-1950s, several thousand 12-inch 33-1/3 rpm LP records, hundreds of 10-inch LPs and 45 rpm records, approximately 1,400 reel-to-reel tapes, as well as piano rolls and digital tapes; posters, paintings and prints; hundreds of examples of sheet music from late 19th-century ragtime to popular songs of the 1940s and 1950s - many of them first editions that became jazz standards; hundreds of rolls of film featuring concert and nightclub footage, funerals, parades, and festivals; hundreds of pieces of relevant ephemera; and architectural fragments from important jazz venues. In recent years, the LSM has undertaken an effort to broaden the Music Collection to include all aspects of Louisiana's musical history. The new strategy involves collecting in a number of areas including: big band/swing, blues, brass bands, cajun, classical, contemporary jazz, country, dance bands, dixieland jazz, funk, gospel, marching bands, Native American music, rhythm and blues, rock and soul and zydeco. The Louisiana State Museum (LSM) evacuated all collections from one of their primary storage and exhibit facilities, the Old U.S. Mint in New Orleans, immediately following Hurricane Katrina. A large and secured climate controlled storage facility in Baton Rouge housed the collections. As repairs and renovations were completed in the Old U.S. Mint, LSM contracted Williamstown Art Conservation Center (WACC) to inventory, document, rehouse, and transport the collections back to the Mint. Katherine Holbrow (then WACC Head of Objects Conservation and project supervisor) began the planning phase with a site visit in October with consultant Emily Kaplan (Move Coordinator for the National Museum of the American Indian). Allison Leone (WACC Assistant Conservator of Textiles and Objects) was selected as Move Coordinator for the project. Six Move Assistants were hired. All appointments were approved by Greg Lambousy (LSM Director of Collections and move project director). A preliminary timeline, budget, tool and equipment list, pest management approach, and conservation and training needs were determined. Tools, equipment, and archival housing materials were researched. On December 6 and 7, Allison Leone and Katherine Holbrow met with LSM Director of Collections Greg Lambousy, George Hagerty (National Special Projects Manager, US Art Company), Ashley McGrew (Lead Preparator, J. Paul Getty Museum). Meetings included discussion of transport strategies, truckload estimates, wrapping and storage techniques, project goals and workflow. US Art Co. was contracted to provide the art transport and loading. An Art Transport Schedule was produced and approved by Grey Lambousy. LSM curatorial staff provided color coded maps projecting new locations for the collections at the Old U.S. Mint. The Move team began working on site at the Baton Rouge warehouse in December, with full staff in place by January. WACC Conservators were also consulted and participated on short-term visits, to assist with planning, setup and address specialized collections needs. Annie VanAssche, Gallery Systems trainer, conducted a Museum System (TMS) database training session for LSM Curatorial staff and Move team on December 12 and 13 at the LSM Collections Storage facility at 1000 Chartres Street, New Orleans. This provided an important review of the TMS program as well as an introduction for the Move Team to issues that LSM has had with migrated data from previous databases in TMS. LSM Curatorial staff and all Move Team members attended a move/packing workshop on January 9 and 10, sponsored by the LSM and led by Ashley McGrew and Angela McGrew, Move Conservator for the Gene Autry Center. The workshop demonstrated workflow ideas, shelving strategies, useful equipment and packing options. Using trays and pallets of Coroplast, fitted with various archival-quality foam supports as needed, long-term storage housings could be adapted to a modular cart shipping system to transport many of the small and mid-sized objects. These storage and transport housings would greatly reduce handling of the objects in the long term, and could be reused for future transport. An Integrated Pest Management protocol was developed and implemented. Housekeeping for pest containment was addressed immediately, including initial clearing and cleaning of aisles and office space, lifting boxes of susceptible materials off of the floor, rehousing loosely-packed archives and non-accessioned materials on the floor, replacing failing containers, wrapping artifacts for freezing, setting pest-monitoring traps along walls in the warehouse, and vacuuming and wrapping empty storage boxes for freezing. A HOBO temperature and relative humidity data logger and a recording hygrothermograph, provided by LSM, were installed in the warehouse to monitor climate controls. In consultation with Jeff Rubin, LSM Information Technology Director, a Photography Protocol was established, including parameters for image file type and size, image modification, and file storage procedures. Following the TMS training session, Allison Leone met with LSM Registrar Tom Lanham to fine-tune a TMS custom form in order to streamline collections data entry. A working TMS protocol was further developed with the agreement of the Registrar and the Director of Collections. This protocol was a working document, due to the various problems presented by specific artifact groups, and was fine-tuned throughout the project. After initial delays, Jeff Rubin and Michael Leathem established a wireless network in the warehouse for TMS database access and image processing on January 23. Following assessment of the storage at the O'Neal warehouse, Move Assistants consolidated groups of boxes and cleared better pathways and aisles. Archival storage materials throughout the warehouse were gathered in a central location. Team members created a map of the warehouse indicating collections boxes coded by department. A central work area with work tables, cutting surfaces, materials, tools and photography setup was created. Using portable workstations set up in the warehouse, Move Assistants identified, recorded, photographed and rehoused objects by department, according to the parameters laid out in the Scope of Work. Rehousing of musical instruments and Jazz artifacts began in January; most instruments received custom storage/transport housings of Coroplast with appropriate supportive inserts. Archival foam in the supports includes 1/8" and ¼" thick Volara sheet, 2" and 1 ¼" diameter Tri-rod (triangular cross-section), and ½" and 1" diameter backer rod (round cross-section) closed-cell polyethylene foams. Pillows made from Tyvek spun-bond polyethylene fabric and resin-free polyester batting or polypropylene pellets provided softer support where needed. 3M 3792 low-melt adhesive sticks adhered the foam supports to Coroplast trays and pallets where needed; these sticks are ethylene vinyl acetate with hydrocarbon waxes (an adhesive combination with good aging properties and long-term reversibility), and do not come into direct contact with the instruments. Some cut surfaces of the polyethylene foams can be abrasive, and barrier layers of acid free unbuffered tissue or Tyvek protect the instruments in these instances. Allison Leone consulted Greg Lambousy (also serving as interim music curator) on packing and documentation of the music collection. Individual storage housings fit onto shelves of rolling carts for transport. Metro brand carts with 2' x 4' shelves served as transport containers for the housings. This size was compatible with three standard tray dimensions (11" x 17", 22" x 17" and 34" x 17"), chosen to work with storage shelf dimensions and appropriately sized for a good percentage of the collection. Fifteen carts fit safely on the 24' air-ride, climate controlled truck brought by U.S. Art. Three fleets of carts allowed for a continuous cycle of loading and unloading necessary for daily deliveries between the two sites (a 1 ½ - 2 hour journey). Transport was scheduled for one-week periods throughout the project, for efficient use of U.S. Art resources. Convoluted polyurethane foam planks on each shelf, under the housings, absorbed shock from cart movement during transport. Thin and pliable high density polyethylene sheeting draped over the instruments in their Coroplast housings. This provided a barrier layer between the instruments and the linear low-density polyethylene stretch wrap used to safely secure the instruments and housings to the cart shelves. 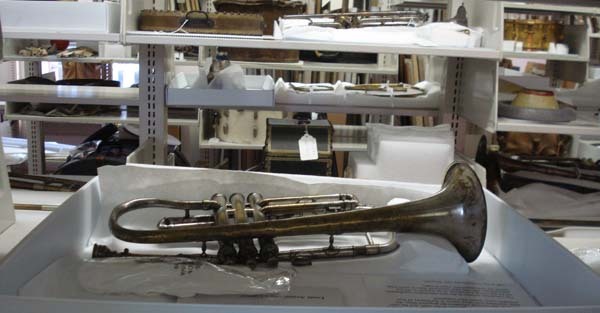 Instruments with cases had previously been stored in their respective cases. These were assessed at the warehouse, and many of the cases were not providing sufficient support and protection. Handles and hardware of the cases were stressed and failing. Some cases were damaging the instruments by abrading surfaces, or off-gassing from deteriorating materials. Since there is ample storage space at the Mint to house instruments and cases separately, Move Team staff opted for this approach after consultation with Greg Lambousy. Certain instruments required special consideration, such as large bass drums, cellos, and string basses. Drums were packed in 2' wide x 4' long x 28" high tri-wall corrugated Commercial Bins, with polyurethane foam for cushioning and a Tyvek barrier / slip layer. They now sit on shelves at the Mint, on top of sheets of Volara. Commercially available stands for large string instruments were modified for transport and long-term storage with archival quality foam, and a rigid-backed support pillow that relieved pressure on the instrument's neck. For transport, stretch wrap around the waist secured the instruments to their stands (with Volara and Tyvek as a barrier layer and cushion). Thick cotton webbing straps drilled to wood pallets held the stands secure during transport. Once in place at the Mint, Move team members removed temporary securing materials and the instruments remained on their stands. Artifacts and associated materials in the Music Collection (record albums, instruments, reference materials, etc.) were transported February 19-22. On February 22, an additional 53' trailer truck provided by US Art supplemented the day's transport. All Music materials were placed in the Mint under the supervision of Greg Lambousy, LSM Director of Collections. Instruments are grouped according to type, with any cases stored on the top shelves of corresponding sections. After shelving, Move team members checked all instruments for readily visible identification tags. These details will assist curators and researchers in accessing the collection with minimal impact to the instruments. This project would not have been possible without the generous support from the National Endowment for the Humanities, the Institute for Museum and Library Services, and FEMA. The Louisiana State Museum music collection is now open to researchers and a new exhibit about jazz and other forms of Louisiana music is planned to open in 2010 at the Old US Mint building. Originally published in: Newsletter of the American Musical Instrument Society 37/3 (Fall 2008), 7-11.